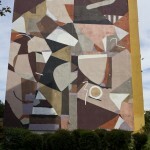 The German artist’s mural is a patchwork of the European community, linked by the thin thread of economic interests. Another prophetic mural from the Monumental Art Collection. Events in subsequent years have shown on more than one occasion how fragile a community based on money is.